If there is anything the UAE is known for, other than petroleum, it is GOLD. Yes, their 24 carat gold is a craze in the country I come from. After all, 22 carat purity is the closest we get back home. And God alone knows how pure that is! No wonder then, Dubai Gold, as it is fondly known as, has a large fan following out here. To start with, the location of a jewellery store in India will always be in a well-known area, with easy access and ample parking. The small shops would cater to a different section of the society and is never on the list of shopping options ever. The display will always have a limited collection. Regular walk-ins are rarely treated to sights reserved for special customers. And the shopping is nothing short of a secret operation. Well, with the amount of security guards and surveillance cams, you do feel you are in some action movie. And don’t forget to make room in the taxes for the same. All stores are probably on a red alert 24 x 7, and yet someday, somewhere a heist does happen. 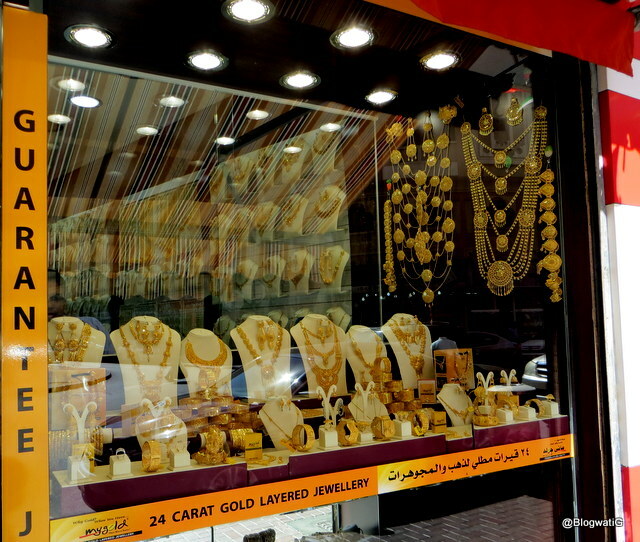 In the UAE, however, you’d find a gold store right next to a Dirham shop where you can buy things for 10 and 20. And well, yes they do have security cameras but no guards in small shops. Their displays are like an over decked bride, you don’t know what to focus on. The stores are on crowded streets and big malls, all alike. People throng because the goods promised are the goods delivered. And their balance sheets always tally coz the punishment for theft is known far and wide. Bottom line, efficient governments don’t bother bickering with the opposition, they oppose anything that comes in the way of efficiency. Vote Smart, India. If you haven’t read Laura Ashley Koeneman till date, you are missing out on HERstory. Rush to her blog like NOW! Prudhvi has much to say about a whole lot of things, her way. Visit her to know more. Replace gold with silver and I am all yours ! I thought you are going to talk about junk jewelry and I had visions of shopping in Janpath when I was in Delhi, but yes Dubai is almost synonymous with gold. Great post. It’s weird how people react to gold, or anything we consider precious. I don’t wear much jewellery and when I do it’s often help together with ribbon. I like a smattering of gold but too much seems flashy to me.